We recently tried many of the Nutrition Corp meals that were sent to us in an iced package. All the meals need to be refrigerated right away and the concept was great. Very easy to make poking 3 holes and microwaving them for close to 3 minutes if you didn’t want to cook them in the oven which took longer. Selections included Chicken Tikka breast that was tasty, chicken thigh that was flavorful, shrimp with sweet potatoes- another nice savory dish and steak with vegetables that my kids loved. Some of the side dishes were spicier than others but all were neat creations and a great overall story by Laureen. They all were very healthy with a mixture of so many nutrients and veggies. Definitely give it a try and order some of their healthy meals. They have many more meals including granola and oatmeal for breakfast and their entrees are low in fat, gluten free and 100% organic. The websites are below to see more how they work, the variety of meal offerings and nutritional content. What stewed in the kitchen in the hands of a young woman, grew into a movement that has now sold meals in the millions. Laureen Asseo, CEO, moves forward in amplifying nutrition education and accessibility. Laureen began to notice her father’s health decline due to the limited access to affordable meals with nutrient-dense ingredients in the U.S. market. She began a rigid plant-based and organic dietary plan, which eventually and incredibly reversed her father’s condition. Word spread of her father’s success and Laureen prepared hearty, organic and vegan meals for friends and family out of their kitchen during her last semester of school. As her networks expanded, Nutrition Corp. continued to grow out of their kitchens and facilities. This expansion strategically placed headquarters in San Bernardino County to operate and ship. Nutrition Corp. inevitably created a niche the market didn’t have. Now in its fourth year of national distribution, Nutrition Corp. ships thousands of meals every day and houses six brands. This growth moves the company closer to changing the way America eats. Nutrition Corp. offers free delivery anywhere in the U.S. and ships every day with a variety of weekly plans or a-la-carte items. This two-tiered system allows you to eat well, feel good, save time, and be your best, everywhere. Weekly plans are designed to seamlessly fit your schedule while a la carte items allow you to try a variety of the seasonal recipes on your time. All meals are free of artificial ingredients and additives providing all-natural dishes. Consumers can order online where they’ll find plans specific to a variety of diets like paleo, vegan and mild flexitarian. Each meal is then delivered to you in expertly sealed in an ultra-portable, insulated packaging. Simply remove and heat to indulge in your health with high-quality nutrient-dense ingredients that provide great quality fuel for the body and mind. Nutrition Corp. understands the responsibility for clean eating, but the company refuses to stop there. The company has founded its own nonprofit, Feeding Friends, which donates thousands a meals a week to local homeless shelters and abuse support centers. Environmentally, Nutrtition Corp. also donates unused produce to local farms to compost. Curated by a team of culinary experts, Nutrition Corp’s Fresh & Lean specialty brand concentrates on exclusively vegan, plant-based meals. With no preservatives, additives, dairy, gluten, GMOs, hormones, added sugar or soy, the meals benefit energy conservation, disease prevention and balance. Fresh & Lean’s natural and always organic ingredients instill a sense of indulgence for your health. The culinary team at Nutrition Corp. designed IONutrition with the masses in mind. This brand aligns closely with the paleo and flexitarian diets to provide a hearty approach to eating healthy. IONutrition is also prepared without preservatives, additives, dairy, gluten, GMOs, hormones, added sugar or soy, consumers can still sample the robust flavors found in a variety of their wild fish, grass-fed bison and cage-free eggs. 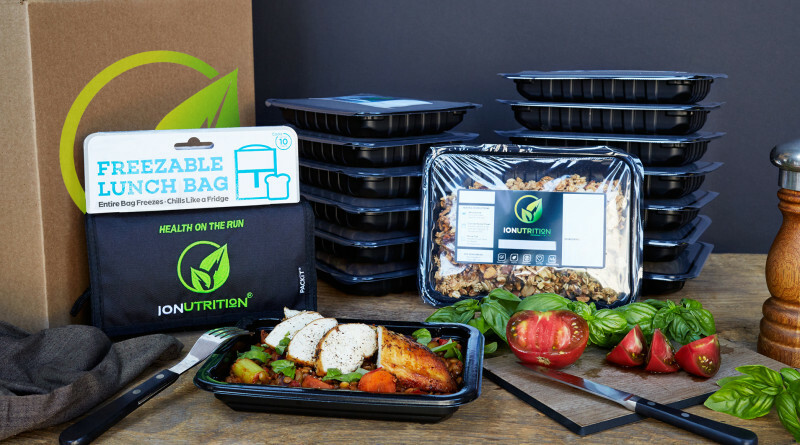 CHINO, Calif. (March 9, 2016) – IONutrition and Fresh n’ Lean, under Nutrition Corporation, an organic meal delivery service, has reached their millionth national shipment. Nutrition Corp. currently houses six brands, including IONutrition and Fresh n’ Lean, that highlight organic, wholesome, plant-based meal options. Through convenient online ordering, Nutrition Corp. moves even closer toward changing the way America eats by providing customizable and nutritious meals delivered anywhere in the U.S., every day. Strategically positioned in San Bernardino County, Nutrition Corp. is headquartered alongside FedEx and UPS shipping hubs. This advantage allows products to spend more time in the kitchen than in travel. Once shipped, food is stored in insulated, specialized sealed packaging to guarantee freshness. Founder and CEO, Laureen Asseo first began preparing vegan meals for friends and family out of her own home. However, as demand rapidly grew, the company expanded into a national meal distributor working toward promoting nutrition education and providing access to wholesome ingredients. Now, with a commercial kitchen and production warehouse, Asseo is leading a talented culinary team as well as shipment operations toward a healthy eating revolution. Meal plans are divided in a two-tiered system featuring weekly options as well as a la carte items. Weekly plans are designed to seamlessly fit any schedule while a la carte items allows the opportunity to try a variety of the seasonal recipes anytime. Nutrition Corp. is unique in that both Fresh & Lean and IONutrition meals are made without preservatives, additives, dairy, gluten, GMOs, hormones, added sugar or soy. These high standards fit within paleo, vegan, flexitarian and celiac-sensitive diets. Nutrition Corporation is healthy meal delivery service that currently houses six brands, specializing in dishes without preservatives, additives, dairy, gluten, GMOs, hormones, added sugar or soy. Distributed nationally and fresh, never frozen; Nutrition Corp. offers expertly prepared and individually packaged dishes to be heated and enjoyed at your convenience. President and CEO, Laureen Asseo expanded into Chino, California in 2012 where she now heads a culinary and production team. Each season unveils new recipes with natural and organic ingredients that adhere to paleo, vegan, and flexitarian diets. Nutrition Corporation provides weekly plans as well as a la carte items where consumers can order online. For information on Nutrition Corporation visit: http://www.ionutrition.com/, https://www.freshnlean.com/.